When I first started these writing tips, I decided to begin at the beginning–manuscript formatting. I realize, however, that I left a few things out, so it’s time to do an upgrade. Of course, different genres such as magazine articles, devotionals, or children’s books, will have their own particular details. And if you’re entering a contest, generally there are specific instructions in the contest rules that you need to adhere to closely. Some agents or book editors might also have specific guidelines, so you should carefully read and follow those instructions. If you haven’t been given specifics, you can’t go wrong with these basics, some of which I mentioned in the previous article. Next, set your margins to one inch. Choose “align left,” not justified, for the body of the text. Insert your “slug”–your last name, a key word or words from the title of your work, and the page number–in the header, aligned right. I also include my email address to make it easy for the recipient to respond, but that doesn’t appear to be standard. For book manuscripts, start the first page of the chapter a third of the way down. The chapter title should be centered. Skip a couple of lines and begin your text, using double spaces. Indent your paragraphs manually by tabbing over a half inch. Do not add an extra line between paragraphs. A book length manuscript should have a title page that includes in the top left your name, address, and email address; centered about half way down, the book title; also centered, a double space below the title, the byline; the word count follows a third of the way from the bottom. Create a special header for this page that is blank. At the end of a chapter, insert a page break so the new chapter will begin on a new page, a third of the way down. After a period only insert one character space. Indicate a scene break with the number sign (#) centered. If I haven’t covered something you need to know, please don’t hesitate to ask. Sometimes I forget I once had to learn the basics. I take for granted that “everyone knows” just how a manuscript should look before it goes off to an editor or agent, but how would we know unless someone tells us? I discovered the “first impressions” rule at a writers’ conference. Even the manuscript critique team member could hardly discuss the elements of my story during my fifteen minute appointment because that person who took on my submission wanted to impress upon me the importance of following standard industry formatting guidelines. I later purchased The Writer’s Digest Guide to Manuscript Formats, which by now is outdated. Yes, these industry standards change. The secret is to remember that editors and agents see thousands of submissions. You want them to be happy to pick up yours because it is easy to read. What is NOT easy to read is some odd font, single-spaced content, and narrow margins. 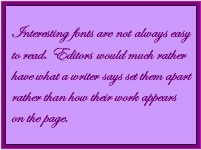 So format your manuscript by using a common font, the kind you find in books or the newspaper. I prefer Times New Roman. Double space your manuscript. Not single. Not one and a half. Also, don’t add an extra line between paragraphs. Set your margins at one or one and a half inch, for both sides and top/bottom. I use one inch—seems like the occasions I’ve had editors or contest coordinators ask for an exact margin, it was always one inch. Be sure to indent the beginning of each paragraph (typically a half inch), but do that manually, rather than setting up your computer to tab automatically when you hit return. It seems that characteristic may not transmit if you send your manuscript electronically. Those are the basics, but of course if you have specific questions, feel free to ask.